Advanced technology, solvent and odor free elastomeric sealant and adhesive. Available in 32 selected colors, matcing the colors of DUROSTICK CEMENTITIOUS GROUTS. It provides high adhesive strength and flexibility with resistance to UV radiation and moisture as well as to acidic and alkaline environments. It does not yellow over time and it is non flammable. It retains its original flexibility over time and adheres perfectly to porous surfaces without priming. 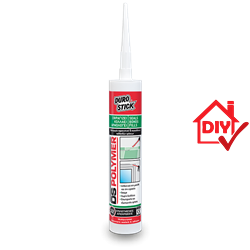 Ideal for sealing joints in kitchen furniture and aluminum constructs (sealing around frames made of steel, aluminum or wood), as well as for grouting the joints between skirting and floor materials. Absolutely suitable for sealing joints on walls made of drywall, cement board, plaster, polycarbonate sheets etc. Use it to create stands made of chipboard. Excellent and safe for installing bathroom mirrors.